n the 1820s, and specifically in the Evangelical movement, we can already see the stirrings that produced first the Cambridge Camden Society in 1839, and then its successor the Ecclesiological Society in 1846. There was a widespread sense of falling off in spiritual and moral standards, nowhere more keenly felt than in the Anglican church itself. "Order" was indeed the watchword, and it was to be preserved above all by ritual performed in the appropriate surroundings. These two societies and their journal, The Ecclesiologist, were committed to this cause. Their efforts and prescriptions had a huge impact not only on the religious practices of their church, but also on the church architecture that would become their most lasting and visible legacy. 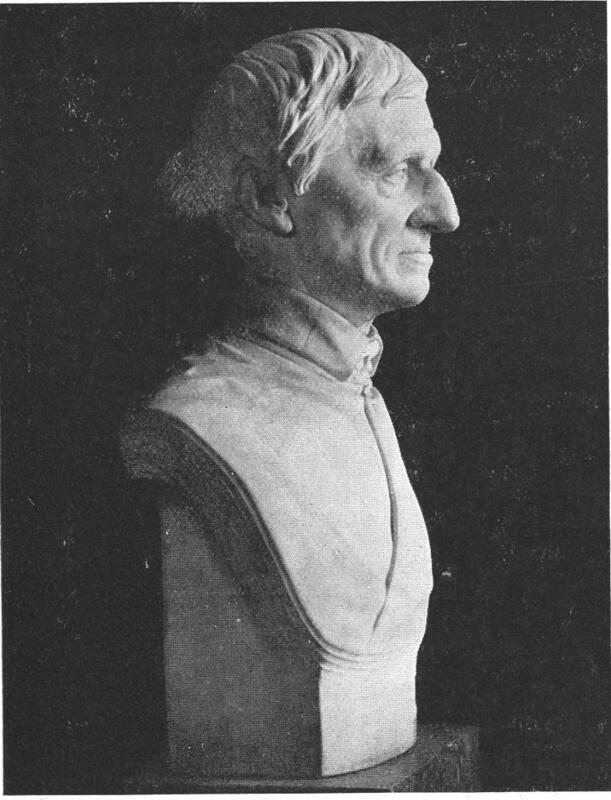 Left: A bust of John Henry Newman by Thomas Woolner. Middle: Salisbury Cathedral, Wiltshire, Fletcher 338 (Plate 140). 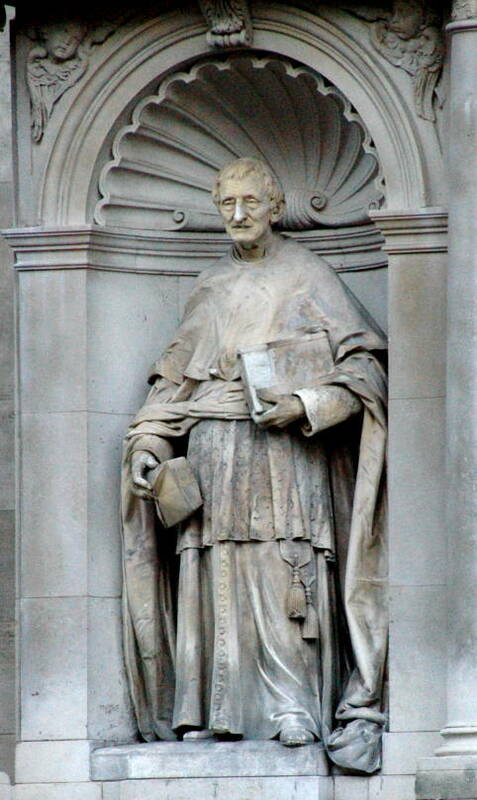 Right: Statuet of John Henry Newman by Thomas Woolner, 1867. Is it fair, is it dutiful, to suffer our Bishops to stand the brunt of the battle without doing our part to support them? Upon them comes "the care of all the Churches." This cannot be helped: indeed it is their glory. Not one of us would wish in the least to deprive them of the duties, the toils, the responsibilities of their high Office. And, black event as it would be for the country, yet, (as far as they are concerned,) we could not wish them a more blessed termination of their course, than the spoiling of their goods, and martyrdom. Now then let me come at once to the subject which leads me to address you. Should the Government and Country so far forget their God as to cast off the Church, to deprive it of its temporal honours and substance, on what will you rest the claim of respect and attention which you make upon your flocks? (No.1). This acknowledged boldly that the Established church was on the brink of Disestablishment. The situation was desperate. The only remedy, it seemed, lay in a return the church's historical (catholic) roots, though not to Roman Catholicism as such — for Newman himself at this point felt that "the Holy Catholic doctrines, in which the Church was set up, were corrupted into Popery, not legitimately, or necessarily, but by various external causes acting on human corruption, in the lapse of many ages" (No.45). Such statements were not enough to deflect accusations of Popery against the movement, but amid the controversy there was excitement, too. The church would be revitalised by a return to earlier forms of worship. This was very much in tune with the Romantic tendency of the times, and to the many "who dreaded or despised the present, the past, and especially the medieval past, was wonderfully exciting" (Clark 135). Against this troubled backdrop, then, emerged a movement that would change the way the Church of England, in every diocese of the country, and even beyond this country, presented itself to the world. The controversial tracts coming out of Oxford were a spur to like-minded people at the "other" university, where a small group of High Church friends read and discussed them. These already saw themselves as Ecclesiologists (see Brine 8), taking the term from one used in the January 1837 issue of The British Critic, Quarterly Theological Review, and Ecclesiastical Record. There, "ecclesialogy" had been defined by an anonymous contributor as "a science which may treat of the proper constitution and operation of the Church" (cited in the OED). In light of Newman's later editorship of the British Critic, it is tempting to assume a direct link between the movements at the two universities. But the concerns of the Cambridge men were rather different. In the British Critic, the word was used in connection with the relationship between church and state, and the "internal" constitutions and operations of the church (see White 49). For the Cambridge group, the emphasis moved closer to the modern meaning of the term, "The science of church building and decoration" (OED). 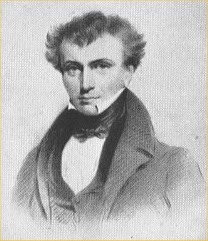 Left: William Whewell, Master of Trinity College, Cambridge. 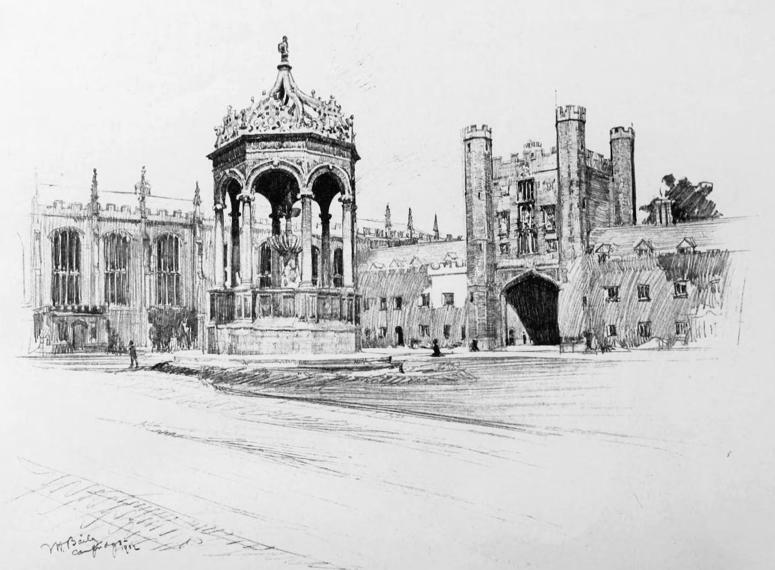 Right: Trinity College, Cambridge, a painting by Vernon Howe Bailey, signed and dated 1902. The group had no spokesmen of the calibre and clout of Newman himself, or of Edward Pusey, and John Keble at Oxford, but in 1839 several of their number took steps to formalise their association. Its revivalist aims were indicated by naming it after the antiquary William Camden (1551-1623); the word "Cambridge" was added later simply to distinguish it from the Literary and Historical Society in Camden, London (see White 37). Probably taking its lead from William Whewell, the influential Master of Trinity and an important architectural historian, the Cambridge Camden Society clearly foregrounded its interest in church architecture. Indeed, it seemed rather similar to the recently formed Oxford Architectural and Historical Society. Its first law stated that its object was "to promote the study of Ecclesiastical Architecture and Antiquities, and the restoration of mutilated Architectural remains" (given in White's Appendix A, 225). Under the leadership of two young Trinity students, J. M. Neale (1818-1866) and Benjamin Webb (1819-1885), with their tutor the Venerable Thomas Thorp of Trinity acting as president, the Society immediately launched into printing "Church Schemes" — forms for recording the salient architectural features of churches. Along with these they produced a booklet on how to look at churches. This was a brilliant first move. Members not only of their own society but of the Oxford one, and even of the general public, armed themselves with these materials and went off sleuthing. This "kind of espionage" produced a valuable database for the Society when the forms were filled out and returned to them (Watkin 70; see also Brine 10). The members' papers for 1839-41, published in The Ecclesiologist, are on highly specialised subjects like chantry altars, London crypts, Gothic mouldings as well as on the state of individual churches. Neale's popular A Few Words to Church Builders was published in 1841 too, and went through eight editions in 1841 alone (Hill 256). Much of this had been anticipated by A. W. N. Pugin, who had published his book Contrasts himself in 1836. He too had deplored the state of the Established Church — indeed, he had already converted to Roman Catholicism by then. He too had strongly pressed the claims of medieval architecture, pointing out that every part of the medieval church was meaningful and appropriate for its purpose: "Here every portion of the sacred fabric bespeaks its origin; the very plan of the edifice is the emblem of human redemption — each portion is destined for the performance of some solemn rite of the Christian church" (Contrasts, 2). Webb, apparently, did not read Contrasts until 1842 (see Brandwood 48). But the kind of ideas informing the architect's polemics were already being channelled by the Society into a programme that reached every parish in the country. In this way, Pugin and the Cambridge Camden Society between them spearheaded one of the great movements in our architectural history: the Gothic Revival. 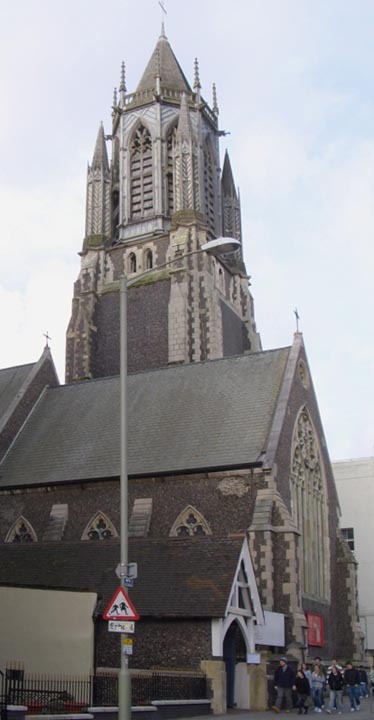 Left two: St Paul's Parish Church, Brighton, with its spacious interior, by Richard Cromwell Carpenter, 1846-48. 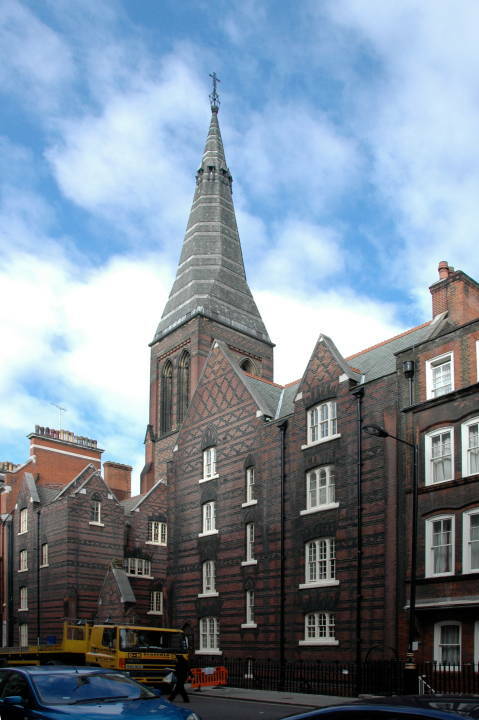 Right: All Saint's, Margaret Street, Chelsea, by William Butterfield, the model church desired by the Cambridge Camden Society, which was eventually built in the 1850s (for its rich interior, see the third section below). Scott was not the only one to be impressed. At its height, the Cambridge Camden Society had sixteen bishops and more than thirty MPs and Peers amongst its members (see Hill 215). Nothing could be a better for an architect now that its seal of approval — though this was exceedingly hard to come by. The architects most closely linked with it were Richard Cromwell Carpenter and William Butterfield, who both contributed designs to the Ecclesiologist. Carpenter was a disciple of Pugin but conveniently Anglican and easier to deal with. 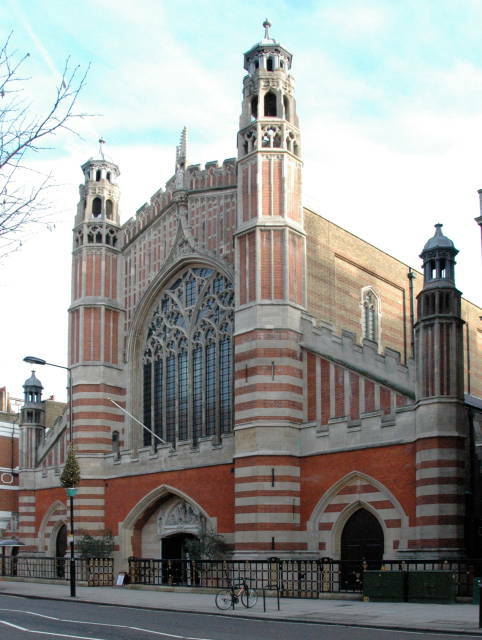 His St Mary Magdalene in Munster Square, London, and St Paul's, Brighton, with their spacious "church hall" plans, fulfilled their requirements almost perfectly (see Elliott 169-70 and 149), while Butterfield's All Saint's, Margaret Street in Chelsea was to be their model church. As the Society states in the Ecclesiologist of 1859, "the erection of this was a day-dream of ours from the first" (184-85). However, despite the Cambridge Camden Society's emphasis on architecture, they and their adherents were ultimately driven by deeper considerations. The features that interested Neale and his fellows, the features they wanted preserved, restored or reduplicated, were not so much the beautiful or ornate ones, as those with ritualistic or symbolic significance. Neale himself owns plainly when first introducing his Few Words to Church Builders that he is no architect. In the second of the numbered paragraphs here, he says he wishes only to show "how churches may best be built in accordance with Catholicity and antiquity and the voice of the Anglican Church." It seems fair to say that the Society's not-so-hidden agenda had always been to "push the church towards higher forms of Anglicanism" (Webster). This had not escaped notice. From 1845, the secretary of the Oxford Architectural and Historical Society was Edward Augustus Freeman (1823-1882), a fine architectural historian, who claimed that "architecture is only an incidental feature in their pursuits" (qtd. in Watkin 72). Translating their ideals into buildings made the Cambridge group's underlying aim more obvious. 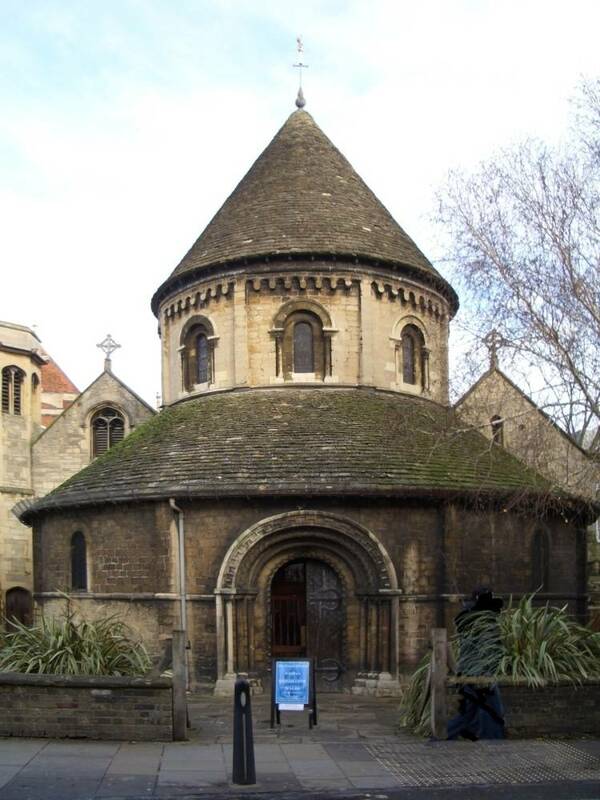 Both their restorations were controversial — Temple Church in London more because of its cost (see Burge v), but the Round Church in Cambridge, much more damagingly, because of its "Popish" fittings. There was an absolute furore over the latter's stone altar and credence table. It reached such a pitch that a leader in The Times of 1 January 1845 called the Society "intrusive and Romanizing" (4). Fears that the Society was indeed going too far towards Rome led some of its most powerful patrons to retreat. In February of the same year, it was announced that the Bishops of Exeter and Lincoln, and the Chancellor and Vice-Chancellor of the University, had all withdrawn their support from it (Ecclesiologist, 71). Webb then read out a motion to dissolve the Society. All this, even before Newman's reception into the Catholic Church rocked the Oxford Movement itself. The volume of the Ecclesiologist in which these withdrawals were reported duly appeared as Vol. I in a new series. An opening "Advertisement" dissociated it from the Cambridge Camden Society in the strongest possible terms: "To implicate that body with it must be considered a wilful perversion of facts." Yet the same Advertisement prefacing this "new" series also says that the committee members "hope, and they believe, that they have redeemed their pledge of conducting the new on the same principles as the first series." Indeed, the words "Vol. IV" appear just above the publication details on the same page, and the volume's content is as strident and opinionated as ever. 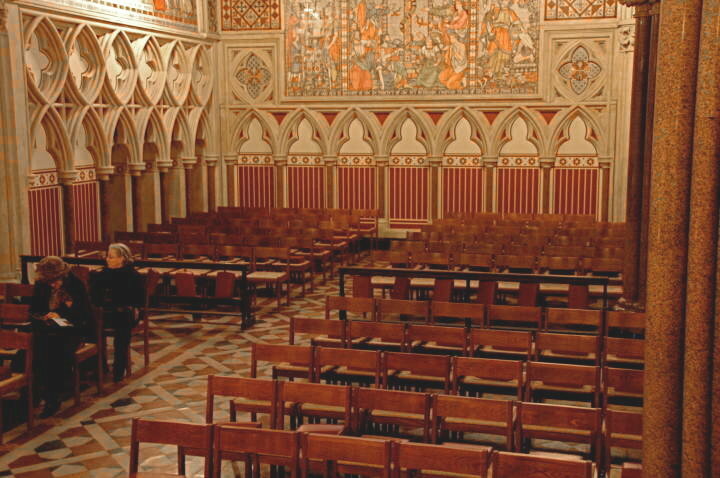 On the matter of pews, for instance: "May we not have a few fixed seats, and let the rest be moveable? We answer, We think not, in the same part of the church" (272). Of the churches brought to the journal's notice, St Peter, Dunchurch is panned: "a parish should not present the appearance of a college chapel" (281); Holy Trinity, St Ebb's, Oxford, is a terrible example "perpetrated under the direction of the President of the Oxford Architectural Society" (more than a hint of rivalry there); while on the same page Holy Trinity, Harborne, Staffordshire is condemned as "an odious structure" (283). The prescriptions, especially for open seating and large chancels for the sacrament, remain unchanged, as does the hectoring and sometimes scathing tone. Hardly surprising, perhaps, since the contributors themselves were mostly the same (see White 145). In the September issue of this same volume, the question of "What is the Cambridge Camden Society doing now?" is openly raised. There had been some new secessions: 21, to be precise. But a grand total of 680 members remained, and a further 30 wished to join (216). This is not as many as the "nearer 800 than 900 members" claimed for the Society in that traumatic February (72). But it is still a sizeable number. The Society, it seemed, had not suffered as badly as feared, either from the attacks on it, or from natural attrition as its undergraduate members graduated. It was now simply lying low. But not for long. After all, the Anglican church was still under siege. Butterfield's Chelsea church, designed several years later in 1849, would still be seen as a kind of bulwark against a faithless age. With Neale and Webb remaining as secretaries, and the journal continuing without any lapse in publication, continuity of purpose and impact seemed assured. It was clear that the Cambridge Camden Society had "surmounted the crises by the simple expedient of changing its name" (Clark 152). 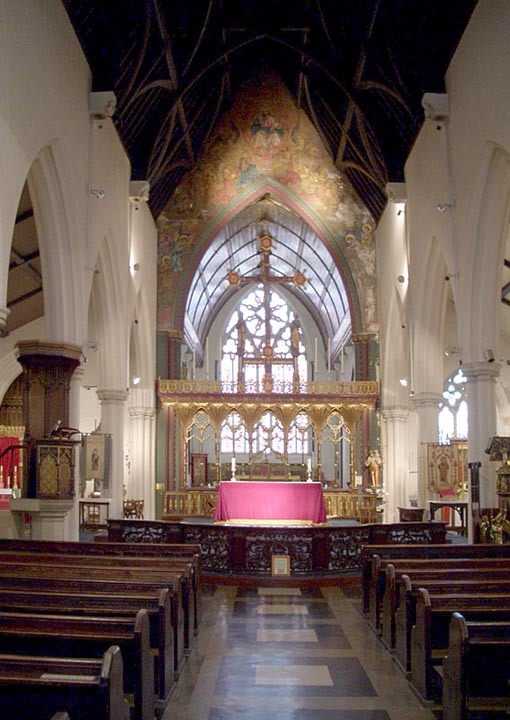 Left two: The glowing interior of All Saints, in which Butterworth developed "an architectural language that was completely his" — but that echoed across the whole "marvellously varied range" of the High Victorian style (Brooks 147). Right: Holy Trinity, Sloane Street, by John Dando Sedding, 1890. Sedding joined the Ecclesiology Society when it started again in 1879. Change did come, however, under the new chairman. Hope was one of those energetic polymaths who crowd the pages of Victorian history. A politician who was elected MP for Maidstone the very year he graduated (1841), he was a writer and journalist, an architectural pundit who would serve as President of RIBA (the Royal Institute of British Architects) from 1865-67. A "Gothicist to his heart's core" (Crook), he was also wealthy, and thus able to finance the Ecclesiological Society's pet project, and Butterfield's masterpiece, All Saints. He championed Scott's original Gothic design for lhe Foreign Office, and William Burges's typically quirky design for the Law Courts. Despite a "violent attack" on Pugin in his first year as chairman, which stunned the architect and alerted him to the fact that the Ecclesiologist had "changed hands" (qtd.in Hill 350), he also became a staunch supporter of Pugin. Less of a ritualist, he was generally more moderate than his predecessors at Cambridge, and more eclectic in his taste. This seems to have been acceptable to Webb, whose Sketches of Continental Ecclesiology came out in 1848, but it eventually alienated Neale (see White 222). In general, the Society's interests expanded, notably in the realm of church music — which, with Neale as one of our best-loved hymn-writers, had always been of much interest (see Webster 331ff.). It dropped the last part of its name in 1852, but, under Hope's leadership, the Ecclesiological Society continued to impose its restrictions on the style of church buildings, so that "[f]or fifty years almost every new Anglican church was built and furnished according to their instructions" (Clark 157). Neale died in 1866, and after a couple of years Webb stopped publishing The Ecclesiologist. But the work of the Society was carried on by its various offshoots — regional societies like those in Yorkshire and Worcester — and in 1879 Hope resuscitated it under the name of St Paul's Ecclesiological Society, with the Dean of St Paul's as its first president (see Cooper). Its prefix, taken from the Society's meeting place, was later dropped, just as its prevous suffix ("late Cambridge Camden Society") had been. With Hope and Webb among its vice-presidents, continuity again seemed assured. Even after the danger of Disestablishment had passed, there still seemed to be a need for such a society. Recommending a certain style was useful: Simon Bradley suggests "that the triumph of archaeological Neo-Gothicism in the Church of England had more to do with keeping its buildings visually distinct from the Nonconformists. than is commonly assumed" (28). Not only that, he adds, but in an age of increasing professionalization (consider the two related practices of architecture and civil engineering), the clergy's "corporate feeling" was enhanced by visible signs of their churches' denomination: "The desire thus to signify that a new church was Anglican should not be underestimated in explaining the success of Cambridge Ecclesiology" (29). But what Hope stressed in his inaugural address was the Society's promotion of the whole "science of worship." It would take in "both building and rubric" and see church architecture "not an isolated art, but the vehicle whereby many arts were put in operation." A prime example of this broader, more inclusive approach was another Chelsea church by a Society member: John. 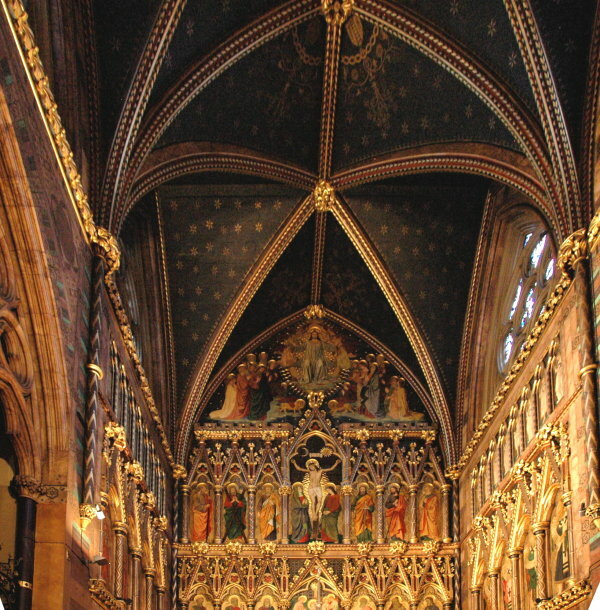 Dando Sedding's beautiful late Victorian Arts and Crafts church, Holy Trinity, Sloane Street — which has a particular reputation for church choral music. 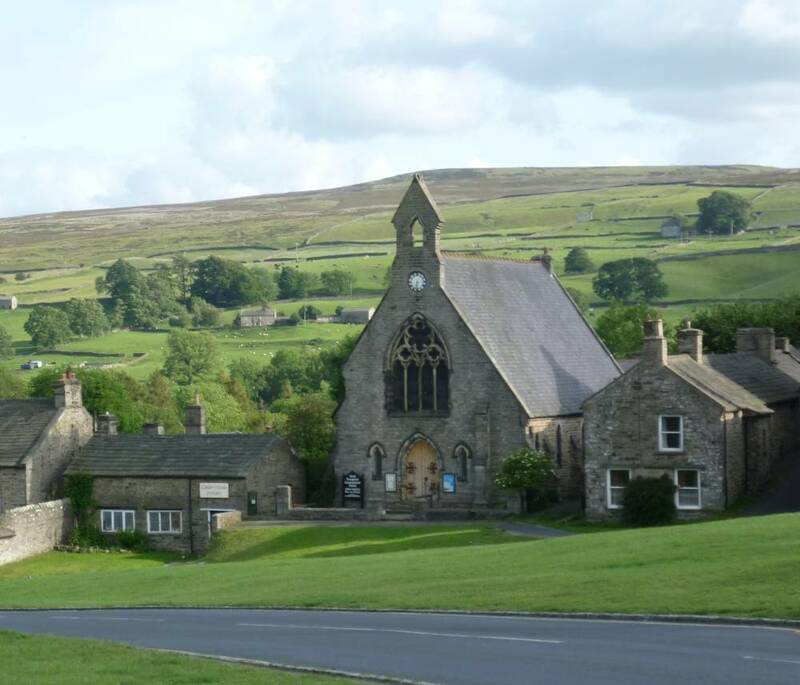 Left to right: (a) Reeth Evangelical Congregational Church, 1866, with its Gothic window tracery, bellcote, and steeply pitched roof, seems to masquerade as the original village church in Reeth, Swaledale. 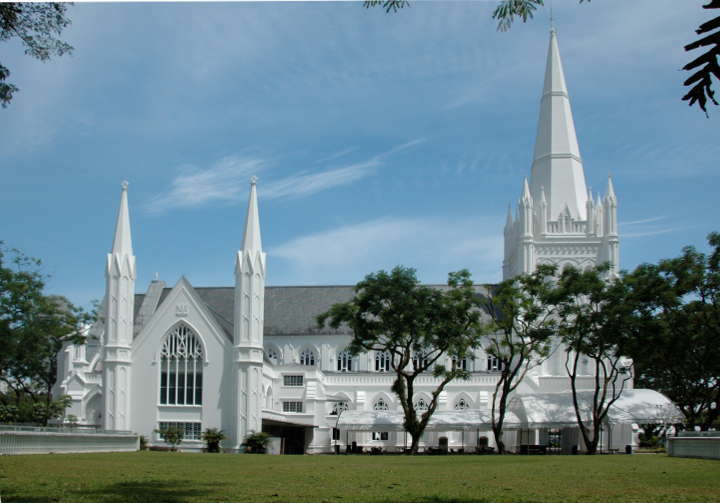 (b) St Andrew's Cathedral, Singapore, designed by Colonel Ronald MacPherson, 1862. 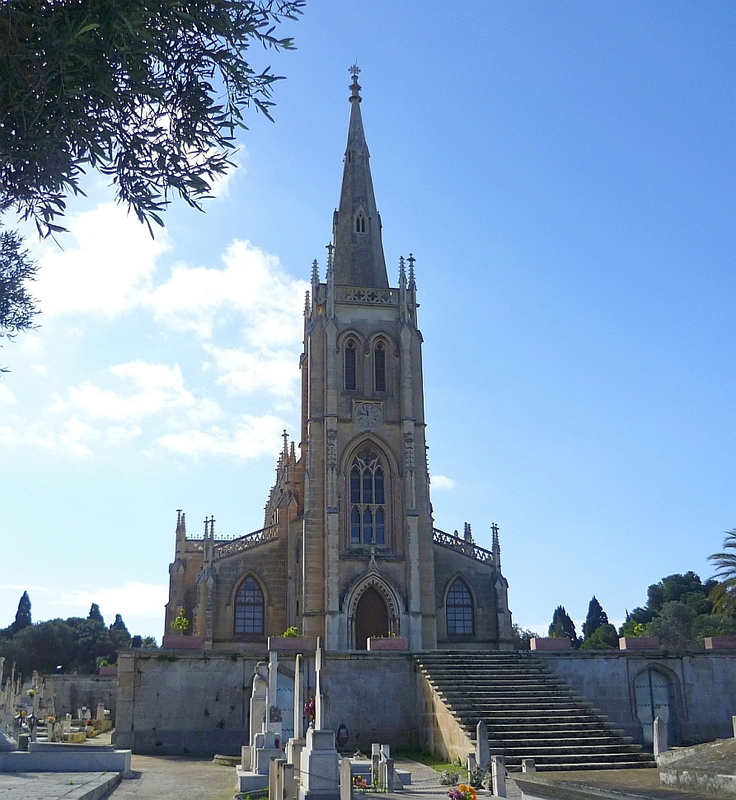 (c) The Santa Maria Addolorata (Roman Catholic) Cemetery Chapel, near Valetta, Malta, designed by Emmanuel Galizia, Chief Government Architect under the British, 1862-69. This new lease of life took the Society right through the rest of the Victorian period and on into the twentieth century, with yet another relaunch in the 1960s bringing it up into the present. The broader programme has continued to appeal to a public composed more of church-visitors than church-goers, and the Ecclesiological Society now has around the same number of members as the Cambridge Camden Society had in its heyday. That original society was, as David Watkin says, "the most influential undergraduate society of all time. . . . Its rigorous insistence on Gothic as the only Christian style transformed the face of the Church of England" (70). Moreover, it had not made its own churches so distinctive after all: its influence was felt in nearly all denominations, and spread into secular buildings as well. Most extraordinary of all, perhaps, through British or British-inspired architects abroad, and architects in Britan who sent their designs abroad, it spread to the furthest ends of the earth. Bradley, Simon. "The Roots of Ecclesiology: Late Hanovarian Attitudes to Medieval Churches." Webster and Elliott 22-44. Brandwood, Geoffrey K. "'Fond of Architecture' — The Establishment of the Society and a Short History of Its Membership. Webster and Elliot 45-61. Brine, Judith. "The Religious Intentions of the Cambridge Camden Society and their Effect on the Gothic Revival." Fabrications 2/3 (1990-91): 4-18. Web. 16 December 2011. Brooks, Chris. "'The Stuff of a Heresiarch': William Butterfield, Beresford Hope, and the Ecclesiastical Vanguard." Webster and Elliott 121-48. Burge, William. 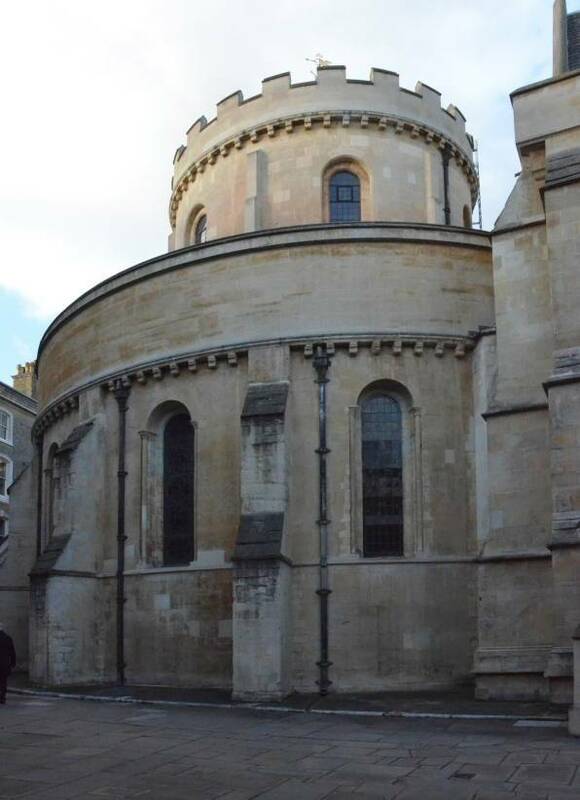 The Temple Church: An Account of its Restoration and Repairs. London: William Pickering, 1843. Google Books. Web. 11 February 2012. Clark, Kenneth. The Gothic Revival. Harmondsworth: Penguin (Pelican), 1964. Print. Cooper, Trevor. History since 1879: "The Non-Professional Study of Ecclesiology: 125 Years of the Ecclesiological Society". The Ecclesiological Society. Web. 12 February 2012. Crook, J. Morduant. "Hope, Alexander James Beresford Beresford (1820-1887)." Oxford Dictionary of National Biography. Online ed. Web. 12 February 2012. The Ecclesiologist (1845). Internet Archive. Web. 12 February 2012. The Ecclesiologist (1859). Internet Archive. Web. 12 February 2012. Elliott, John. "A Trusted Disciple: Richard Cromwell Carpenter." Webster and Elliot 149-72. Fletcher, Sir Banister, and Banister Flight Fletcher. A History of Architecture on the Comparative Method. 5th ed. London: Batsford, 1905. Internet Archive. Web. 12 February 2012. Hill, Rosemary. God's Architect: Pugin and the Building of Romantic Britain. Harmondsworth: Penguin, 2008. Print. Hope, Alexander James Beresford Beresford. Essays. London: Rivington, 1844. Internet Archive. Web. 12 February 2012. Imperial Magazine: A Compendium of Religious, Moral, and Philosophical Knowledge. Vol. XI (1829). London: Fisher, 1829. Print. Inaugural Address — 1879 (Report of). The Ecclesiological Society. Web. 12 February 2012. Neale, J. M. A Few Words to Church Builders. Cambridge: Cambridge University Press, 1841. Internet Archive. Web. 12 February 2012. Newman, John Henry. Apologia pro Vita Sua. London: Routledge (?1907). Internet Archive. Web. 12 February 2012. Pugh, R. B., and Elizabeth Crittall, ed. The Cathedral of Salisbury: Eighteenth to Twentieth Centuries." A History of the County of Wiltshre, Vol. 3 (1956). British History Online. Web. 12 February 2012. Pugin, A. W. N. Contrasts: A Parallel between the Noble Edifices of the Fourteenth and Fifteenth Centuries and Similar Buildings of the Present Day Shewing the Present Decay of Taste. London: Pugin, 1836. Google Books. Web. 12 February 2012. Scott, Sir George Gilbert, R.A. Personal and Professional Recollections, edited by his son, G. Gilbert Scott, F.S.A.. London: Sampson Low, Marston, Searle, & Rivington, 1879. Internet Archive. Web. 5 January 2012. Tracts for the Times. Vol. 1 (1833-34). London: Rivington, 1834. Internet Archive. Web. 12 February 2012. Transactions of the Cambridge Camden Society. Cambridge: Stevenson, 1841. Internet Archive. Web. 12 February 2012. Watkin, David. The Rise of Architectural History. London: Architectural Press, 1980. Print. Webster, Christopher, and John Elliott. "A Church as it Should be": The Cambridge Camden Society and Its Influence. Stamford: Shaun Tyas, 2000. Print. Webster, Donald. "'A Mass All Sung to Ancient Music': The Society's Influence on Church Music." Webster and Elliot.331-347. White, James F. The Cambridge Movement: The Ecclesiologists and the Gothic Revival. Cambridge: Cambridge University Press, 1962 (reissued 1979). Print.